Krinkle Clown is a foundation stock curly mare. 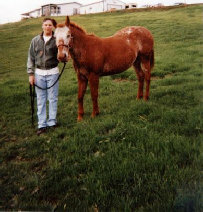 She has curly bloodlines with a cross of the Appaloosa bloodlines in her pedigree. "Krinkles" is an exceptional riding horse, especially trail riding. She has the fast Appy "single foot" gait and can really cover the ground. She stands 14.2 hands and throws foals larger than herself. Krinkles has had all curly "appy" colored foals to date. This mare is sensible, she has never had a mark on her since we bought her, she stays out of fences, does not cause any trouble in the herd and raises sensible babies. If there was a real ,bombproof, mare, she would be it. I have never seen her spook out on the trail. She is kept in condition by my 15 year old son, he has been riding her for 4 years. Krinkles has a tight curly coat.